Face-to-face interpreters spend much of their day moving from clinic to clinic, and waiting for appointments. 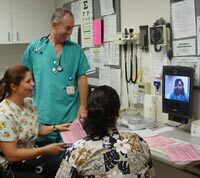 ALVIN allows your interpreters to reach any clinic at any time without ever leaving their office. Our existing clients have reported that ALVIN has improved their interpreters’ efficiency by over 400%. In addition to making the interpreters more efficient, ALVIN removes much of the overhead in your existing infrastructure. ALVIN automatically routes interpretation requests, so there is no need for a dispatcher. Services to test, support and train interpreters are also available through certified educational institutions, reducing the administration required to support a staff of interpreters. In a recent study prepared for the California HealthCare Foundation (CHCF), clinicians reported satisfaction with ALVIN in several areas, including ease of use, quality of communication and timeliness of connection. The near consensus of clinicians also agreed that ALVIN improved the quality of care.